The Chinese space agency will be launching the Chang'e 4 moon lander on Friday 7 December, hoping to make China the first country to land on the far side of the moon. Dutch astronomers are also looking forward to the launch as they are collaborating with Chinese scientists on this mission. A satellite containing a Dutch radio instrument has already been launched to the far side of the moon, ready to be switched on once the moon lander touches down. How is the Chang'e4 satellite doing? 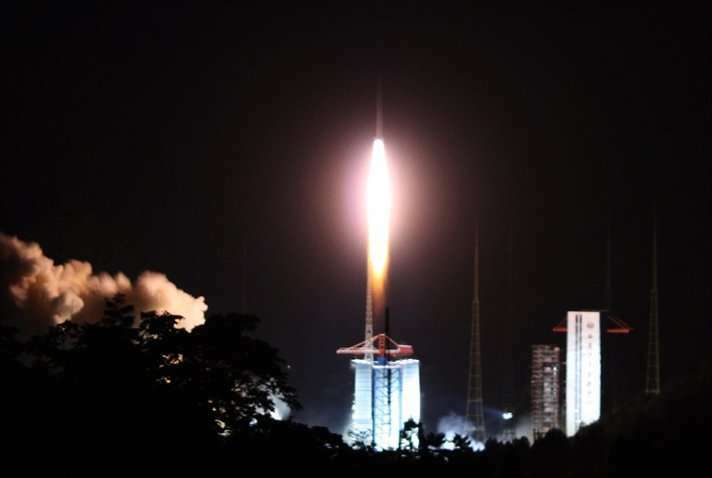 China's Chang'e 4 relay satellite was launched on 21 May this year, following the launch of the moon lander. The satellite is now in place behind the moon to provide communication between the moon lander and the earth, and is equipped with a radio instrument made in the Netherlands. The Netherlands-China Low-Frequency Explorer (NCLE) was developed by a team from Radboud University, the Netherlands Institute for Radio Astronomy (ASTRON) and the company ISIS. The instrument is expected to start making scientific observations early next year. The whole Dutch team is keenly anticipating the launch on 7 December, not only because it will be the first ever landing on the far side of the moon, but especially because scientists from the Radboud Radio Lab in Nijmegen and ASTRON are also part of the Chang'e 4 mission's scientific team – the first time they have been involved in a moon landing. Astrophysicist and Managing Director of the Radboud Radio Lab, Marc Klein Wolt, explains, "With our instrument installed on the relay satellite, we have become the first Dutch team ever to be part of a mission to the moon. That was special enough, but this makes it even more special." While no instruments from the Netherlands will be on board the Chinese lunar lander itself, the Dutch radio instrument on the satellite and the Chinese radio instrument on board the moon lander will carry out observations together. Albert-Jan Boonstra, program manager at ASTRON, adds: "We are particularly interested in how well our sensor is doing under the extreme conditions in space, in relation to the design and the sensitivity of the radio instrument on the moon lander. Both instruments are not only designed to collect scientific results, but they also provide us with technical information needed to design a future flock of small astronomical radio satellites." Radio astronomers typically use one of the many radio telescopes on earth to make observations, but with the NCLE instrument, the Dutch team is opening a new window to the universe. They are seeking to tune in to radio signals with wavelengths that cannot be detected on earth due to our planet's atmosphere. "The NCLE is paving the way for a future large-scale radio experiment on the surface of the moon to observe the weak signal emitted just after the Big Bang, before the first stars were formed. That's why this moon landing is so interesting, because for the first time, we have the chance to study the conditions for radio astronomy on the moon," Heino Falcke explains, Professor of Astroparticle Physics and Radio Astronomy, and scientific leader for the NCLE instrument. Moreover, the Chinese lunar lander will only be operational for a month or two, whereas the NCLE is expected to be in service over the next five years. The hope is that the NCLE will be rolled out and switched on a few weeks after a successful landing.